This supplementary media briefing follows on from one circulated by BCRC on 28 June 2018 (luang-nang-non-cave-rescue-thailand). It reports developments especially in the period over the weekend into today, Monday morning, local time in Chiang Rai province. Please note that it remains BCRC policy not to confirm the names of the British cave rescuers, even though names have been stated in various media reports. We make a plea that their privacy is respected, to allow them to get on with their difficult task without distraction. 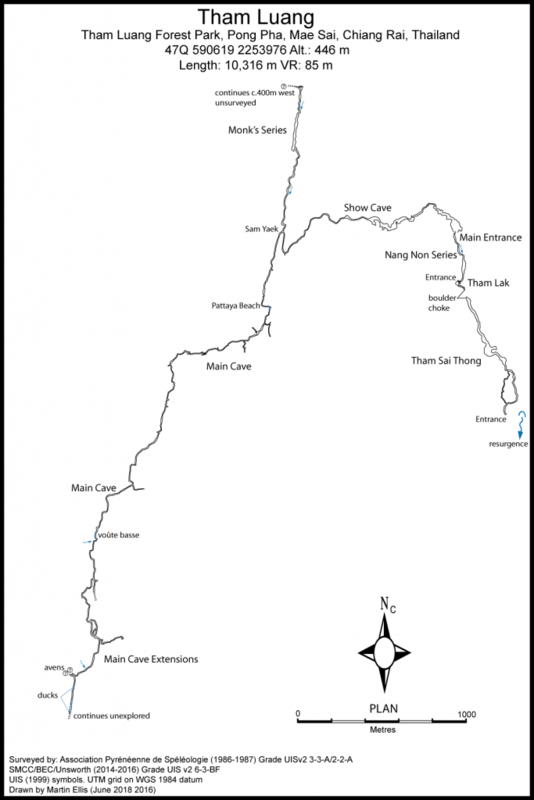 Following an improvement in weather conditions in Northern Thailand water levels in the Tham Luang Nang Non cave have to some extent dropped, flow rates have lessened and underwater visibility has improved. Consequently, it was possible to recommence diving operations on Sunday. Two of the British cave divers on the BCRC team sent out to Thailand last week are currently path finding through the flooded passages laying guide lines as they go. They are supported by a large team of Thai Navy SEAL team divers and divers from Australia and the USA who are ferrying in diving bottles and establishing air supply dumps. Overnight progress had reached Monks Junction some 1,500 metres from the entrance and 800 metres beyond the start of the flooded section. It is hoped that diving today will reach a point called Pattaya Beach some 500 metres beyond the limit reached overnight and if this location is reached, it will open up significant opportunities to search for the missing boys in some of the further reaches of the cave system. The 12 boys and their football coach have been trapped underground since Saturday 23 June and the situation for them will be desperate without food or light for such a period. Many share hopes that this window of improved conditions may allow the rescuers to reach the most likely location of the lost boys whilst there remains a chance they are still alive. Briefing compiled by Peter Dennis (BCRC Chairman, Bill Whitehouse (BCRC Vice Chairman) and Gary Mitchell (BCRC Assistant Chairman).